The following information will help in your decisions about what you can load in your pickup, as well as how you can load your pickup. The most common cable used for tailgate support cables is 3/16” stainless wire rope (¼”with vinyl jacket). An individual cable has a breaking strength of about 4200 lbs. and a safe working load of about 840 lbs. Does this mean that you can safely put a 1680 lb. (2 x 840)load on your tailgate? No it does not! There are two ways a tailgate can fail. 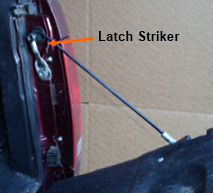 The tailgate can buckle, or a tailgate cable or cables can break. Due to the expense of tailgates and the unwillingness of people to let us destroy a tailgate while it is attached to their pickup, we focused our testing on the capacity of the cables. Tailgates that are dented, bent or bowed likely have lost strength and should be replaced. One should avoid concentrating a heavy load in the center of the tailgate since that is the weakest point of the tailgate from the stand point of buckling or bending. If you are loading a heavy motorcycle such as a Harley Davidson, you should use a ramp that spreads the load where it rests on the tailgate. The wider the better - the more the load is spread out, the less likely you are to buckle your tailgate. The safe working load for a tailgate cable assumes that the cable, cable end fittings and attaching hardware are in good condition. If they are not, we recommend that you replace them with Original Equipment Manufacturer (OEM) cables and/or hardware. The provided information is intended to give you an idea of how loads placed on your tailgate are translated into cable tension. We are not telling you how much you can safely load into your pickup, just the factors you must consider for your particular situation. We measured tailgate cable tensions that resulted from loading an ATV and other vehicles in various pickups using a cable tension meter. We measured the static tailgate cable tension with the VBL in positions A, B and C.
We also measured the static tailgate cable tension resulting from 150 lbs. 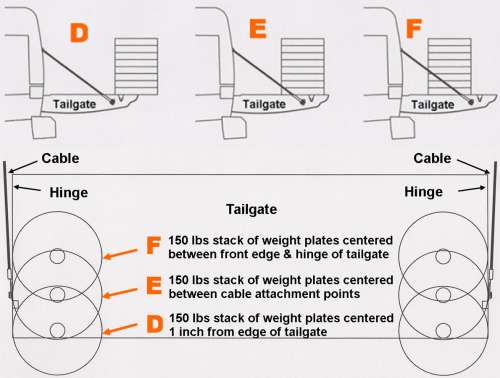 of weight plates placed on each side of the tailgates in positions D, E and F. We chose 150 lbs. (300 lbs. total) as it approximates one axle on an ATV or one wheel on a cruiser motorcycle. Q. I cannot close my tailgate with my motorcycle loaded. Is it ok to hold my tailgate partially open by looping my tailgate cables around the tailgate latch strikers? A. No. This can damage the wire rope strands. Bending cables around too small a diameter stretches the wire strands on the outside of the bundle and causes a slight kink. Repeating the straightening and kinking cycle will cause the cable to lose strength due to fatigue. A good rule of thumb is that the ratio of the diameter of the object that the cable is curved around to the diameter of the cable to is at least 20:1 i.e. 3/16 inch cable should be wrapped around an object that is at least 3-3/4 inch diameter. Q. I have a side-by-side (UTV) that is too long to fit in the back of my truck without leaving the back tires on the tailgate. Can my tailgate handle the weight when transporting it? A. We think you would be taking a big risk since the dynamic tension in the tailgate cables caused by uneven road surfaces could easily be several times the static tension. If transporting with a load on your tailgate is your only option then drive as if you were hauling a tub of nitroglycerin. We would have liked to have measured the dynamic tailgate cable tensions generated when trucks were driven down bumpy roads with various loads resting on the tailgate, but I could not find anyone willing to monitor the tension gauge while I drove. All of our tension measurements were taken with the vehicle being loaded in various positions, either partially or fully on the loading ramps and/or pickup bed/tailgate. A. I have a 6 inch lift kit on my truck. Does the height of my lift affect how much weight my tail gate will support when I load my quad? Q. No. It just makes loading more thrilling.